I V Gone, under jockey jockey Edgar Martinez, winning the $17,500 Golden Driller Stakes Sunday night at Fair Meadows Race Track. 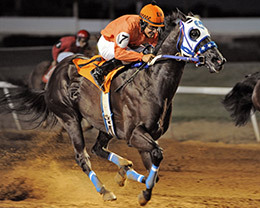 TULSA, OK�JUNE 19, 2016�At 18-1 odds multiple graded winner I V Gone dueled early under jockey Edgar Martinez before driving to a three-quarter length win over stablemate Secret Courage in the $17,500 Golden Driller Stakes Sunday night at Fair Meadows Race Track in Tulsa. I V Gone completed the 350 yards in :17.399 seconds, a 99-speed index. The $10,230 winner's purse boosted his career earnings mark to $124,250. Juliana Mancillas saddled the 6-year-old son of multiple stakes sireIVORY JAMES to eighth career win for owner Celesse Fregoso. Bred in Oklahoma L.P. Frank, I V Gone is out of the Takin On The Cash mare Bye Bye Bygones. Mancillas also saddled runner-up Secret Courage to his second place effort for owner Francisco Acevedo. Burnett Ranches, LLC bred the graded stakes winner in Texa. Ridden by Benny Landeros rode the 6-year-old earner of more than $178,500. Acevedo also owns third place finisher Mr Special Cartel, a 4-year-old colt ridden by Cody Wainscott. He picked up $1,601 to bring his earnings mark to $61,223. Tigertail Ranch bred Mr Special Cartel in Oklahoma. Mr Jo Eagle, Iba Wagon, I Bleed Red, Zoominatjess, Talktomeson, Ja Long Gone Gol and Tempting Secret Dash completed the field.